Army takes conttrol of LTTE sugandan base north of Kiriibbanwewa in Mulathive , one of the "one four " base complex. Addressing a rally on Saturday, in Anuradhapura in support of the United People's Freedom Alliance candidates contesting the North Western Provincial Council election, President Mahinda Rajapaksa said that no period in history since the time of King Parakramabahu the Great has seen a development drive as the present one launched by the Government. The President also pledged that just as the East was liberated from the clutches of terrorists, so too will the last remaining strongholds of the LTTE, KIllinochchi and Mullaitivu, be liberated so that people living in those areas too can benefit from the Government's overall development strategy. He further pointed out that what was happening in the North was nothing more nothing less than a humanitarian mission to reaffirm the right to life of all peoples, Sinhalese, Tamil, Muslims and others. He also praised the heroic efforts of the security forces, observing that they have already weakened considerably the strike capabilities of the LTTE and that theirs is a mission to recover a free and independent nation for all peoples. The President urged Armed Forces personnel still on vacation, to report to their respective duties at their very earliest as their valuable and dedicated services were vitally and urgently required for their Motherland at this crucial juncture. 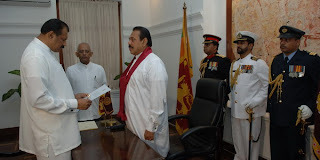 President Rajapaksa made this call when he addressed a mammoth rally in Anuradhapura, the first in a series of rallies, in support of the UPFA candidates contesting the Sabaragamuwa and North Central Provincial Council (PC) elections on August 23. 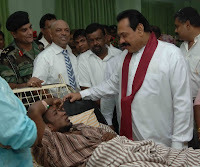 President Rajapaksa lauded the great zeal and enthusiasm displayed by the disabled ‘war heroes’ in the Anuradhapura hospital, whom he had visited them that day. “These ‘war heroes’ who were badly disabled were too willing to get back to the battlefront again, if they were discharged from the hospital. They were determined to fight the terrorists, tooth and nail, and capture Kilinochchi and Mullaitivu,” he said. Roads, schools and other mega development projects such as the Norochcholai, Kothmale and Kerawalapitiya power projects and the Moragahakanda irrigation project among others, would be taken forward expeditiously. The spree of victories achieved by the Government would be further augmented by a definite and a landslide victory at the forthcoming PC elections of Sabaragamuwa and North Central on August 23. “This would undoubtedly consolidate our Government, the Armed Forces and the people,” he added. The President noted that the farmer obtained a reasonable and high price for his paddy, and thereby given his due place. Nevertheless, he pointed out that when the farmer is benefited in this manner, obviously the consumer would experience a problem. “So, there should be a ‘balancing act’, where both the farmer and the consumer is protected. We will ensure that both parties’ interests are taken into consideration”, he added. Refuting claims as reported in certain quarters of the media, that the President would also resort to a referendum, the President categorically ruled it out. “I will never ever resort to ‘Kalageddi Sellama’ practice. I will hold the PC elections, followed by the Parliamentary elections. I will win that too. Everything is in the hands of the people whom we represent,” he said. He added that the masses of ‘Raja rata’ had immense faith and trusted the UPFA government, and beyond any possible doubt, they would elect Berty Premalal Dissanayake as the Chief Minister of the North Central P.C. In the context of firing Indian fishermen are coming under in the Indian ocean, the Indian Navy has advised that the fishermen should fix Global Positioning Systems (GPS) to avoid crossing the maritime boundary. It (GPS) is not very costly and is affordable, the naval advisory says. GPS provides the fastest and most accurate method to navigate, measure speed and determine location for fishermen. The Tamil Nadu government is working on a pilot project to equip fishermen with country boats in Ramanathapuram district with handheld GPS devices. The Naval advisory assumes significance as fishermen particularly of Rameswaram area went on a strike and received local political backing over alleged firing on their vessels by Sri Lanka Navy. 'They (Lankan Navy) never cross into our (Indian) territory", a senior naval officer based in Tamil Nadu was quoted as saying by India's premier news agency, PTI. The agency report which was widely covered said the Indian Naval officer, Commodore P E Van Halteren denied July 25 the allegations that the Sri Lankan Navy was straying into Indian waters and firing at Indian fishermen. This certificate lends credence to reports that LTTE was targeting Indian fishermen with a view to divert attention from its own operations in the area. Any how, as Halteren reportedly said, the fact of the matter is Indian fishermen sail too close to Sri Lankan maritime boundary, particularly at night with a view to have a better catch. And at night time it is difficult for Lanka navy to differentiate between fishermen and the LTTE, according to the Indian Naval official. So his advisory to the Indian fishermen is: 'It would be better if our fishermen do not cross the International Maritime Boundary Line and enter their (Lanka) territory'. 'If the fishermen carry GPS with them, it would warn them when they crossed the maritime boundary', Commodore Halteren was quoted as saying. The Global Positioning System (GPS) is easy to use and it is affordable, he said and suggested that awareness should be created among fishermen about its usage. About 18,000 boats of various types are engaged in fishing, and it is not possible for the navy or coast guard to provide protection to every boat. The Naval official said this much when he remarked, 'It is very difficult for us to guard each and every fisherman when they venture into sea. Our duty is to just check whether any boat or ships are involved in any illegal activities. However, as an extra effort, we always warn our fishermen whenever they are very close to the boundary area'.